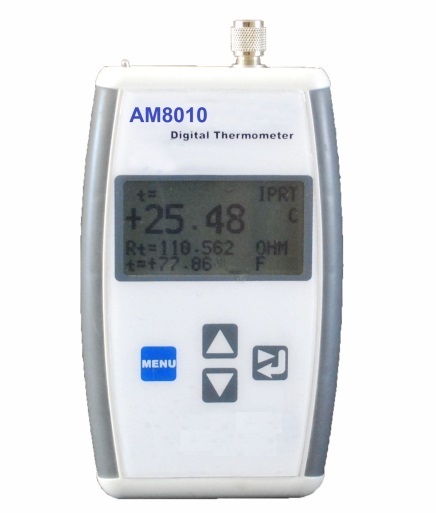 AM8010 is a handheld digital thermometer with high accuracy, fast readings and great stability. This readout is perfect for field applications as well as lab measurement. Though small in size, AM8010 is powerful when it comes to accuracy, which can be as high as 0.01 °C at 0 °C. A USB interface allows user to log and display real time data on a PC. AM8010 digital thermometer allows users to choose ITS-90, IEC-751 (DIN), or Callendar-Van Dusen conversion methods to response various PRTs. All probe constants and coefficients can be keyed in through front panel. This portable readout is a powerful device with relative small price. 1750-12/20 Secondary Reference PRT, -200°C to 670°C.